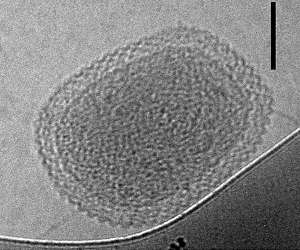 An ultra-small bacterial cell (scale bar is 100 nanometers) is thought to be a relative of the microorganisms that encode diversity-generating retroelements. Image courtesy Birgit Luef, Norwegian University of Science and Technology. It's the stuff of science fiction, though there's nothing fiction about it: Researchers have discovered a multitude of previously unidentified microorganisms possess a genetic element that enables them to self-mutate. What's more, these organisms are so great in number that they dramatically expand the diversity of the tree of life. "These microorganisms can be 500 times smaller than bacteria like E. Coli," said UC Santa Barbara microbiologist David Valentine. "They also do unusual things to some of the key genes used for identification, like splitting them into pieces small enough to render them invisible to scientific surveillance. This combined with their ultra-small size explains why they were missed until recently." To pinpoint these miniscule organisms - tiny enough to pass through filters that capture traditional microbes - the scientists turned to groundwater samples from a Colorado aquifer. Analyzing numerous genomes therein, they detected a prevalence of an unusual genetic element they had encountered once before: diversity-generating retroelements (DGRs). The new findings appear in the journal Nature Microbiology. Co-author Valentine, a professor in UCSB's Department of Earth Science, along with postdoctoral scholar Blair Paul and co-authors from UC Berkeley, UC San Diego and UCLA, show that these DGRs are active in sprawling lineages of recently discovered phyla: two classes of archaea - primitive, single-celled, bacteria-like microorganisms - and among potential new bacterial candidates in the biological tree of life. These new biological classes appear to disproportionately harbor DGRs, which enable them to target their own genes for accelerated mutation. Lead author Paul analyzed more than 500 genomes out of a pool of 2,500 and found that the majority of a certain class of archaea, as well as a yet-to-be-characterized phyla closely related to bacteria, appear to have DGRs. In fact, many possess multiple DGRs. "These microorganisms are so small they have minimized the amount of information they can code, so they are probably not totally self-reliant," said Valentine, also a professor in UCSB's Marine Science Institute. "This means that they engage in some form of either symbiosis or parasitism. If a microorganism shrinks down its genome and its cell to this very minimal lifestyle, it has to have mechanisms that allow it to evolve new capabilities but also to shed unneeded ones." Valentine noted that the DGR mechanism might allow these organisms to do both. Or perhaps, he posited, they optimize to the point where it's no longer beneficial to mutate and have to rid themselves of the capability. "The finding that DGRs are relatively widespread in tiny bacteria with symbiotic lifestyles is of great interest because these elements likely contribute to the incredible diversity of protein sequences found in these organisms," said co-author Jill Banfield, a professor of earth and planetary sciences at UC Berkeley. While very little is known about how DGRs self-regulate, scientists are finding that these elements are able to guide and target specific sites for mutation. By examining DNA sequence from the genomes, the researchers saw recent mutation activity and observed the mechanism in action by virtue of its RNA being transcribed. "One of the reasons we were able to see the pattern of mutations in the DNA was because the data set recovered such a depth of genomes that we could see the variability within them," Paul said. The mechanism targets only one of the four different nucleotides (A, C, G, T) that form the basic structure of nucleic acids such as DNA. Nucleic acid synthesis and degradation require enzymes to facilitate either process. In fact, a biochemical artifact of an enzyme was what first revealed this mechanism to the UCSB investigators. A distinctive signature and location as well as only A mutations are hallmarks of this mechanism. "There are similar proteins that don't mutate only A but are error prone," Paul explained. "We think that this enzyme is similarly prone to creating mutations." Because the scientists are dealing with new organisms, they have not yet been able to determine what the vast majority of the diversified proteins do. "An important question is whether these mutations alter the proteins that the genes encode or are they meant to interrupt the genes themselves and target them for removal from the genome?" Paul asked. "If this mechanism forces mutations that cause some genes to go defunct, it could be associated with evolutionary benefits." "This discovery reveals how rapid evolution happens in some of Earth's smallest and most common, yet least-known, microbes," says Mike Sieracki of National Science Foundation's Division of Ocean Sciences, and a director for the Dimensions of Biodiversity program, which sponsored the research. "There is still so much to discover about the microbial world," said Leslie Rissler, Dimensions of Biodiversity co-director. "This research provides a glimpse into the unique mechanisms that allow adaptation and responses to environmental stress."